At CES 2018 it felt like almost every single new TV announced featured some form of voice assistant integration. It's not enough for them to feature millions of pixels and billions of colors, now everyone wants you to talk to them as well. Keen to get in on the act, Samsung has announced that its 2018 Smart TVs are getting voice assistant integration...but it's probably not the voice assistant you want. While other manufacturers have embraced Alexa and Google Assistant, Samsung has - perhaps unsurprisingly - opted to include its own voice assistant, Bixby. We shouldn't be surprised since Samsung has been keen to position Bixby as a viable alternative to Amazon and Google's efforts. We just don't think it has the same power just yet, despite its integration with Samsung SmartThings and other recently shown off developments such as individual voice control. 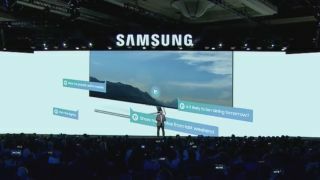 The announcement is part of a wider move by Samsung to ensure that all of its appliances are 'intelligent' by 2020, and we're sure that Bixby is a central part of that. Previous Samsung TVs featured a more limited voice search interface, but this is the first time a fully-fledged voice assistant will find a home in their TVs.